There are many toxic chemicals in household products. You can use non-toxic cleaners instead, or mix up your own solutions to green cleaning. An extraordinary amount of shelf space in the grocery store is devoted to household cleaners, air fresheners, and other products intended to help you keep your house smelling and looking sparkly clean. But as you're achieving that shiny state, are you adding unwanted chemicals to your living space? If standard, popular household products are in your shopping cart, then the answer is yes. In today's guest article, Alice Shabecoff, co-author of Poisoned for Profit, discusses the toxic chemicals lurking in those innocent-looking jugs and spray bottles. She also lists alternative, natural cleaning solutions for those who are ready to make the move to green cleaning. No smart and caring parent would spend a small fortune to end up harming her child. But that's just what we do every time we enter a supermarket and come out with an armful of products intended to spiff up our homes. We buy air fresheners, toilet cleaners, drain uncloggers, laundry fluffers, bug killers, countertop degreasers, bacteria-slaying soaps, silver shiners... and much more. In sum, an average of 23 different boxes, cartons, jars and bottles of house cleaning products, each with its distinct mission, crowd our cupboard shelves. Our typical expenditure is $15 a week. Household cleaning products have grown into a major industry, costing consumers $13.5 billion a year. What's in these products is a mystery. Manufacturers are not required by law or regulation to tell us the ingredients. Attempts in Congress to require full disclosure labeling are opposed by the companies, which prefer limited and voluntary listings, perhaps on a website. When you discover the ingredients lurking in these products, you understand why the manufacturers hide them behind the veil of "trade secrets." Of course, just because many of the ingredients are tongue-twisters that might bring back unpleasant memories from high school chemistry class, that doesn't mean they are dangerous. But scientific research has proven that these man-made chemicals concocted on a base of petroleum can reduce fertility, trigger cancer, and intensify asthma. The most disturbing news is that a pregnant woman's exposure may harm her fetus, affecting the child's brain and behavior as well as his body (though, to be accurate, science now agrees that mind-body are one). The chemicals in mothballs can cause liver and kidney damage, as well as cancer. Glycol ethers, one of the chemicals commonly found in various household cleaners, are industrial solvents—used, for example, to clean gunk off machinery and computer chips. If a pregnant woman is exposed, even at low levels, her baby may suffer birth defects or damage to his developing testicles or central nervous system. Even the commonly-used Comet Disinfectant Powder Cleanser releases 143 air contaminants. Seven (including chloroform, benzene and formaldehyde) can cause cancer; others are linked to asthma and allergies as well as harm to our reproductive and nervous systems. This discovery comes courtesy of independent lab tests commissioned by the Environmental Working Group, a nonprofit research organization. Air fresheners turn out to be among the most toxic products in our homes. The chemical analysis of one of the leading sellers, sporting the scent of a "Hawaiian breeze," found this aerosol released 89 air contaminants. Its label disclosed only three. Of all the products tested, this "freshener" came in third place for polluting the air with ingredients linked to cancer, allergies, and reproductive harm; and if the exposed woman is pregnant, the ingredients could do damage to the fetal brain and nervous system. The plug-in variety contains "the most highly volatile chemical in the average home." Even air fresheners labeled "natural" contain harmful ingredients. "Natural" is a term without any standards behind it. Dryer sheets, another winner of the most-toxic-substance award, coat fabric with a thin film of artificial perfumes whose chemical components are linked to liver damage and cancer. We grab these cleaning products off the store shelves, convinced they work. Years of advertising have told us so. With our overworked schedules, we need to make it easy to get that sparkly clean. The good news is, we don't need these toxic commercial products. Non-toxic products are available in natural food stores and online, but it's also easy to make a few basic products ourselves which work as well, if not better. Every ingredient you need is right there on the drug store or supermarket shelves. It's actually fun to concoct these cleaning alternatives, and rewarding to see the results. And there's so much less to worry about when it comes to long-term exposures or if a toddler comes across one of these products. Next revelation: Contrary to what marketers would have you believe, we don't need a dedicated product for each separate component of our house, from shower tiles to floors to underwear. Think of the storage space that will be freed up by slimming down from 23 individual cleaners to just 8 basic ingredients, all very safe. Who couldn't use more storage space? Who can't think of a good use for the money saved? Buy a couple of spray bottles at the hardware or drug store (or re-use the ones the commercial products came in). Here are some household products and the toxic chemicals in them. Natural green-cleaning alternatives are listed in the rightmost column. Laundry detergent Phthalates, monoethanolamene, alkyl- and nonyl-phenol ethoxylates, aluminum hydroxide	Add 1/2 c borax or 1/2 cup baking soda to phosphate-free liquid Soak clothes in hydrogen peroxide for 1/2 hour to whiten. P.S. My own favorite recipe for my least favorite task, cleaning oven racks: Put them in your bathtub, cover with water plus 1/2 cup dishwasher detergent, soak a few hours or overnight. Amazing. 1. 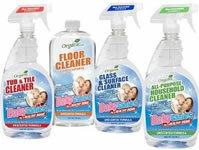 Host a Green Cleaning Party — Buy a green cleaning party kit and hold a house party with your friends. This is lots more fun than 'tupperware' parties used to be, and a great deal better for your family and the environment. The kit is made and sold by Women's Voices for the Earth. HealthyStuff.org — a searchable database of 900 consumer goods, from cars, pet products to children's car seats, back-to-school items, and women's handbags. Alice Shabecoff is a freelance journalist focusing on family and consumer topics. Her work has appeared in the New York Times, Washington Post, Christian Science Monitor, and International Herald Tribune, among other publications. She was executive director of the National Consumers League, the country's oldest consumer organization, and executive director of the national nonprofit Community Information Exchange. Her books include Poisoned for Profit and A Guide to Careers in Community Development. Ubiquitous exposures to toxins are contributing to increasing rates of birth defects, asthma, cancer, and other serious illnesses, especially among children. The onslaught comes from manufacturing processes, power generation, nuclear waste, heavy metals, even consumer products. Why do we let corporations weasel their way around regulations, sabotage investigations, hire scientists to skew data on toxic impacts, and fend off government controls with powerful lobbying groups? It's time for families to fight back by ridding their homes of toxic products and through citizen action. Poisoned for Profit shows how. See book on Amazon.com. Know someone who might like this article about Green Cleaning vs. Chemicals In Household Products? Please forward it to them. See more books related to green living/green homes. Shopping at Amazon via the links on this and other pages on Grinning Planet helps support our effort to inform the world about important issues and smart solutions. Thanks! Pollution is no longer just about belching smokestacks and ugly sewer pipes—now, it's personal. The most dangerous pollution, it turns out, comes from commonplace items in our homes and workplaces. To prove this point, for one week authors Rick Smith and Bruce Lourie ingested and inhaled a host of things that surround all of us. Using their own bodies as the reference point to tell the story of pollution in our modern world, they expose the miscreant corporate giants who manufacture the toxins, the weak-kneed government officials who let it happen, and the effects on people and families across the globe. This book focuses on cleaning the green way—naturally, with no chemicals. It guides you room by room, explaining how to clean thoroughly and efficiently in manner that is good for your health and your world. Included are tips on choosing cleaners, cleaning difficult areas, changing to green personal-care products, and more. Become a green cleaning machine! "Air fresheners turn out to be among the most toxic products in our homes.... Even air fresheners labeled "natural" contain harmful ingredients. "Natural" is a term without any standards behind it." This clean-building professional's tips on how to use natural cleaning agents will save you money and keep the toxic chemicals found in most "normal" cleaners out of your home. Watch natural cleaning products video.